At this year’s Aging in American Conference in Washington, DC (March 20-24), the National Indian Council on Aging (NICOA) will have two posters on display in the Marriott Wardman Park Hotel Exhibit Hall A. A poster session is a great opportunity for conference participants to take in information at their own pace and get a more in-depth understanding of some of the issues being discussed during other conference workshops or panels. Additionally, the posters’ creators and sponsoring organizations often take questions and discuss the posters during set times throughout the conference so you can learn more about their creation and content. NICOA will have two posters available for viewing during this year’s conference: ‘Contributing Factors to American Indian/Alaskan Native Elders’ Quality of Life’ and ‘Technology Use Among American Indian/Alaskan Native Elders’. Rebecca Owl Morgan, Project Coordinator, and Christine Herman, Technical Communications Manager, will be in the Exhibit Hall from 12:00pm to 1:30pm on Tuesday, March 22nd to discuss the posters with conference attendees. 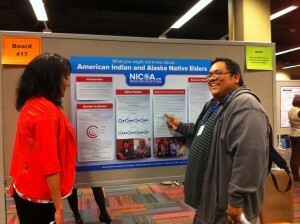 The data presented in NICOA’s poster sessions was collected in a survey at the 20th Biennial Conference of the National Indian Council on Aging in 2014. These posters will share information with attendees about how hearing and dental care contribute to a better quality of life for American Indian/Alaska Native elders and how AI/AN elders are using and accessing technology, such as computers, cell phones, and email. For more information on NICOA’s Biennial Conference, which you can attend this year in Niagara Falls, NY. Please contact NICOA at info@nicoa.org for details.